Contrary to what you might believe, being a dapper dude doesn't require that much effort. 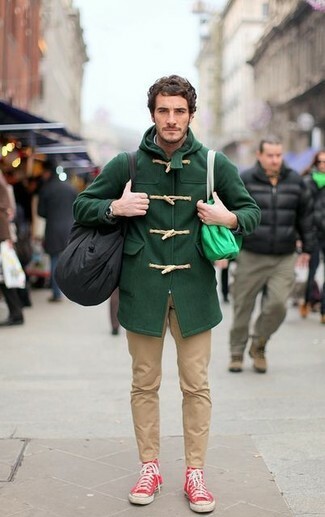 Just rock a dark green duffle coat with Theory haydin writer pant and you'll look incredibly stylish. Want to go easy on the shoe front? Opt for a pair of red high top sneakers for the day. For a casually elegant getup, reach for a navy blazer and Theory haydin writer pant — these items work nicely together. You could perhaps get a little creative when it comes to footwear and lift up your ensemble with navy suede tassel loafers. If you're on the hunt for a casual yet dapper outfit, team a navy wool parka with Theory haydin writer pant from Saks Fifth Avenue. Both items are totally comfortable and will look great paired together. For something more on the daring side to finish off this ensemble, choose a pair of black and tan snow boots. If you're searching for a casual yet sharp look, consider teaming a light blue cardigan with Theory haydin writer pant from Saks Fifth Avenue. Both items are totally comfortable and will look great paired together. When it comes to footwear, this look is round off wonderfully with navy suede loafers. This combo of a brown check wool blazer and Theory haydin writer pant is so easy to pull together in next to no time, helping you look amazing and ready for anything without spending a ton of time rummaging through your closet. 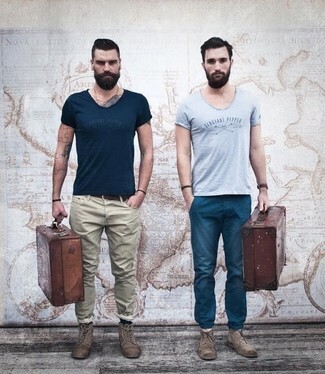 For something more on the daring side to round off this look, grab a pair of brown athletic shoes. 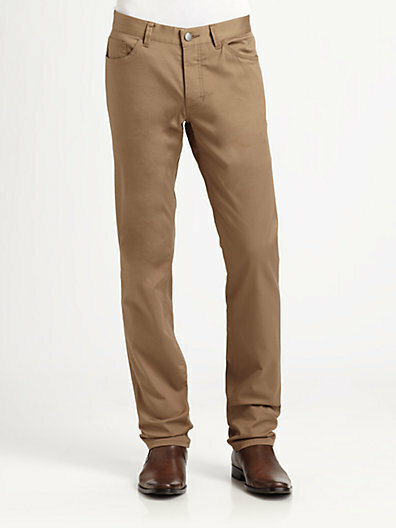 If you're on a mission for a casual yet sharp outfit, marry a navy v-neck t-shirt with Theory haydin writer pant. Both items are totally comfortable and will look great together. Feeling inventive? Complement your look with brown leather casual boots. 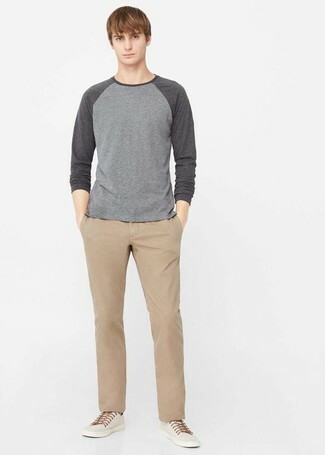 If you're looking for a casual yet on-trend outfit, try pairing a grey crew-neck sweater with Theory haydin writer pant. Both items are totally comfortable and will look great together. When it comes to footwear, this outfit is finished off nicely with beige plimsolls. 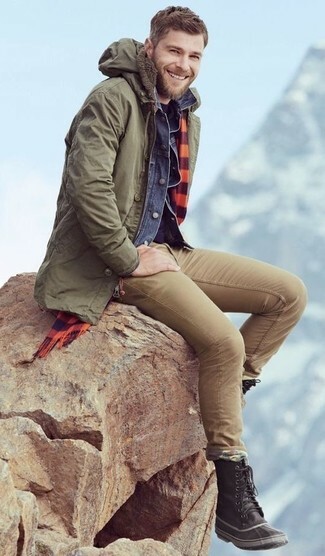 If you're hunting for a casual yet sharp look, wear an olive parka and Theory haydin writer pant from Saks Fifth Avenue. Both garments are totally comfortable and will look great paired together. Dark brown snow boots will deliver a casual vibe to your look. 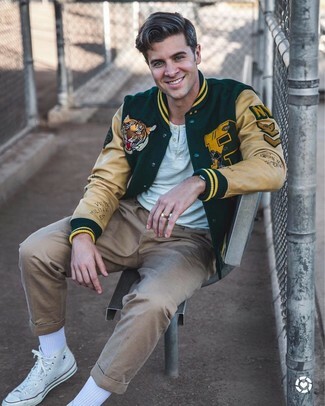 Why not go for a dark green varsity jacket and khaki chinos? Both of these items are super comfortable and will look awesome when paired together. Feeling adventerous? Change things up a bit by rocking a pair of white canvas high top sneakers.